Leah Zissimopulos hasn't added a story. Guided by our vision of a world where everyone has a safe, affordable place to live, Alachua Habitat for Humanity brings people together to build homes, communities, and hope. READY TO BE PART OF SOMETHING SPECIAL? Brave Edgers will have the opportunity to rappel down the 5001 Building at Celebration Pointe, in exchange for donations back to the amazing local non-profit organization, Alachua Habitat for Humanity. Experience the once-in-a-lifetime opportunity to rappel down the 5001 Building! We envision a world where everyone has a decent place to live and we work towards that vision by bringing people together to build strength, stability, and self-reliance through shelter. To accomplish these goals, we invite people of all backgrounds, races, genders, religions, political views - or any of the other distinctions that too often divide us - to build together in partnership with local families in need of affordable housing. Through volunteer labor and donations of money and materials, Alachua Habitat has built more than 135 homes in the local community. Habitat houses are sold to homeowner families at no profit and financed with affordable loans. Working together, side-by-side, we build solid houses, new relationships, and stronger communities. 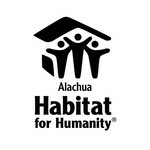 Founded in 1986, Alachua Habitat for Humanity is a non-profit organization with our own 501(c)3 designation. We are the local affiliate of Habitat for Humanity International. Although we work in partnership with Habitat for Humanity International, Alachua Habitat for Humanity is an independent organization led by a local board of directors to coordinate all aspects of our work, including fundraising and program oversight. Sign up now, or make a donation! Leah Zissimopulos hasn't posted any updates yet. Alachua Habitat for Humanity is managing the funds for this campaign.